You bring a wealth of strengths and abilities, the capacity to learn from your life experiences, and a vision of how you want your life to be. As a clinical social worker, I bring specialized knowledge of human development and behavior and social, economic, and cultural systems to help people restore or improve their functioning. Together we will determine how I can help in the areas in which you are struggling. Some people need psychotherapy, some need the help of a professional organizer, and others need both. The risks and benefits of each will be reviewed with you so that you can make the best decision possible. K-Squared helps people change their lives – on the inside through psychotherapy, and in their environments through professional organizing. 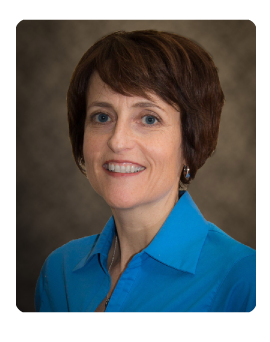 Karen Kruzan, LISW-S, CPO-CD® has spent the past 30 years changing lives. She is a psychotherapist, professional organizer, published author, and national speaker. She is the owner and operator of K-Squared Organizing, LLC. Karen received a Bachelor of Science degree in 1987 from Providence College and a Master of Social Work degree in 1988 from The Ohio State University. Ms. Kruzan worked for almost 20 years as a therapist for children, families, and adults before transitioning to work in the health insurance industry. Following that, she was the Director and then CEO of Youth Forum, Inc., a public organization that provided project and utilization management of public resources in Franklin County. In 2007 she started K-Squared while also serving as Quality Improvement Coordinator for 4 years at a local community behavioral health center. In 2010 and 2014 Ms. Kruzan was the featured organizer on TLC's Hoarding: Buried Alive. "Karen is awesome and a blessing. Very personable and easy to work with." "I won't ever call anyone else for help." "Everything was great for us! Keep up the service standard that we received"
"I felt me, my family, and our issues mattered. Karen cared." You will be receiving services from a licensed social worker, and as such, certain aspects of organizing may differ from those of professional organizers who are not dually credentialed. Sometimes the goals are simply to create a more organized space or a process to make your life easier or more pleasant. In those situations, our work together may be very similar to those provided by other organizers. Whether you need help de-cluttering your home, managing daily responsibilities, or organizing your office, I will use all the knowledge and skills I have as a social worker and as a professional organizer. While working side-by-side on your organizing goals, I may ask questions to better understand your thinking styles, the barriers you have encountered, or other issues that are keeping you from meeting your goals. Individual therapy - I rely on a broad range of techniques, including but not limited to cognitive-behavioral (CBT), client-centered, solution-focused, and other integrative interventions. In psychotherapy, you can expect to learn about your moods, feelings, thoughts, and behaviors. You will gain a better understanding of why you do what you do and learn how to take control of your life and respond to challenging situations with healthy coping skills. My specialties are depression, anxiety, AD-HD, and hoarding disorder. Group therapy - I offer group psychotherapy for those struggling with chronic disorganization or hoarding behaviors. Dr. Barbara Jo Dennison, Ph.D., LISW-S and I designed and co-lead this 10-week psychotherapy group, Fresh Start. We screen all participants to put together what we hope will be a supportive, dynamic, and change-oriented process. We all need a little help sometimes, especially when our work with people ventures outside our comfort zones or skill sets. Whether you are a professional organizer working with a client with mental health challenges or more severe disorganization than you are comfortable, a therapist working with clients who are chronically disorganized or who hoard, or another professional who needs to learn more about mental health conditions or causes of disorganization, I can help you with the knowledge and skills I have as a social worker, psychotherapist, professional organizer, and small business owner, combined with previous experiences running a non-profit organization and working in quality improvement. We conduct the consultation by phone calls or a HIPAA-secure platform such as Skype for Business, in person, or in the client's environment. (K2 Organizing, LLC will enter a non-compete agreement with you whenever there is direct client contact). Professional Consultation services are billed in 30 minute increments, so you pay only for what you use. Package rates are available. How Did I Get All This Stuff? And Now What Do I Do With It? Lose the Stuff. Find Yourself. You are invited to take advantage of a free, no obligation, thirty minute meet-and-greet (excluding psychotherapy). During this time, I will determine if I can help you, and you will determine if I am the right person to work with you. I do not take on new clients if I don’t believe I can help them, and if this is the case I will refer you to others who might be a better match. K-Squared serves the central Ohio area. We will travel to other locations in certain situations. If you have been struggling with disorganization and hoarding for a while, this workbook is for you. You may have read other organizing books without seeing any changes in your home. This workbook will help you understand more about chronic disorganization and hoarding, evaluate your situation, and help you discover how your thoughts, feelings, and life experiences play a role. 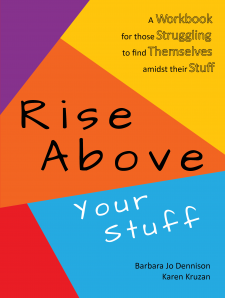 You will read the stories of others in similar situations and be guided through activities to help you “Rise Above Your Stuff". These colorful cards are perfect for anyone who struggles to make decision about whether to acquire or discard something. 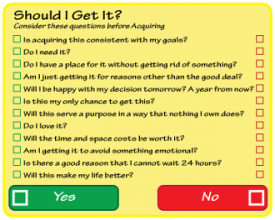 The question prompts help you gather your thoughts and feelings to form a decision that is right for you. The cards are small enough to carry with you, and they are laminated for durability and can be written on with a dry erase marker.